With its tall, gently curved back and slightly flared legs, our mahogany side chair leans towards subtle sophistication. A hand rubbed black finish invites a modern vibe but the cushioned panel center framed in brass nail heads is a reminder that French tradition is never far away. 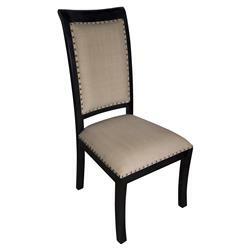 This chair sits well with your elegant French provincial tastes.